Barwick Boitano Drink Driving Lawyers, expert advice from an experienced DUI lawyer. Barwick Boitano are specialists in Drink Driving, Traffic offences, Speed Cameras & Demerit Points. Drink Driving is a crime; a very serious crime and the penalties vary depending on how much you have had to drink. Invariably after you have been stopped by the Police and have a failed a roadside breath test, you are arrested and conveyed to the Police Station to undertake further breath analysis. Generally you receive a fine and your licence is suspended. However a criminal conviction is also recorded. There are however, circumstances where you can avoid receiving a criminal conviction as a criminal record can effect you in many ways particularly employment prospects as well as security and background checks. Having been represented by a specialist drink-driving lawyer you can put a strong argument to the Court on your behalf is a must if you want to try and achieve this. If you have a clean record and you haven’t been drinking that much, and you are only just over the legal limit of .05 there is good chance that Barwick Boitano Lawyers can help you and avoid a criminal conviction. Barwick Boitano Lawyers Parramatta offers superior legal advice in all aspects of drink driving and driving related offences. Contact Us Today on (02) 9630 0444. The penalties for major traffic offences are set out below. There is a higher penalty for a second major offence within 5 years. The disqualification periods are found in s. 25 Road Transport (General) Act . 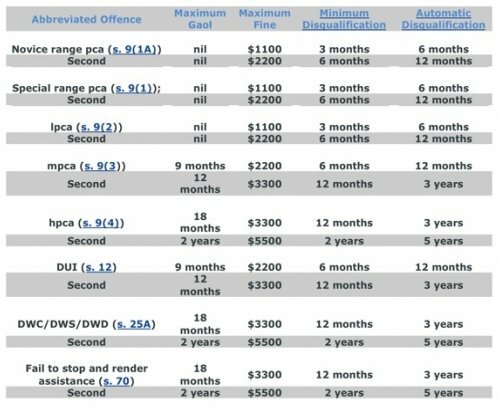 In working out the fines, it is important to bear in mind that the term ‘penalty unit’ is currently defined as being $110: s. 17 Crimes (Sentencing Procedure) Act. PCA’ of course refers to the ‘prescribed concentration of alcohol.’ Novice range pca’ applies only to drivers who hold a learner’s licence or a provisional licence. The range is less than .02 but more than zero. ‘Special range PCA’ is pca for special categories of driver, who include learners, provisional drivers, disqualified or cancelled drivers, and drivers under 25 who have not driven for 3 years. The range is .02 or more but less than .05. HPCA is ‘high range pca’ and is .15 or higher. DUI is ‘drive under the influence’. ‘DWC’ is the offence of ‘drive while cancelled’, ‘DWS’ is drive while suspended, and ‘DWD’ is the offence of ‘drive while disqualified’ under s. 25A Road Transport (Driver Licensing) Act. ‘Fail to stop’ (s. 70 Road Transport (Safety and Traffic Management) Act) is the offence of failing to stop and render assistance after an accident in which a person is killed or injured. Penalties for drive manner dangerous, refuse analysis, and alter concentration are the same as hpca.